COLOSSUS-Class Light Fleet aircraft carrier ordered from Cammell Laird, Birkenhead on 7th Aug.1942 and laid down as Yard No 1126 on 3rd Dec. 1942. 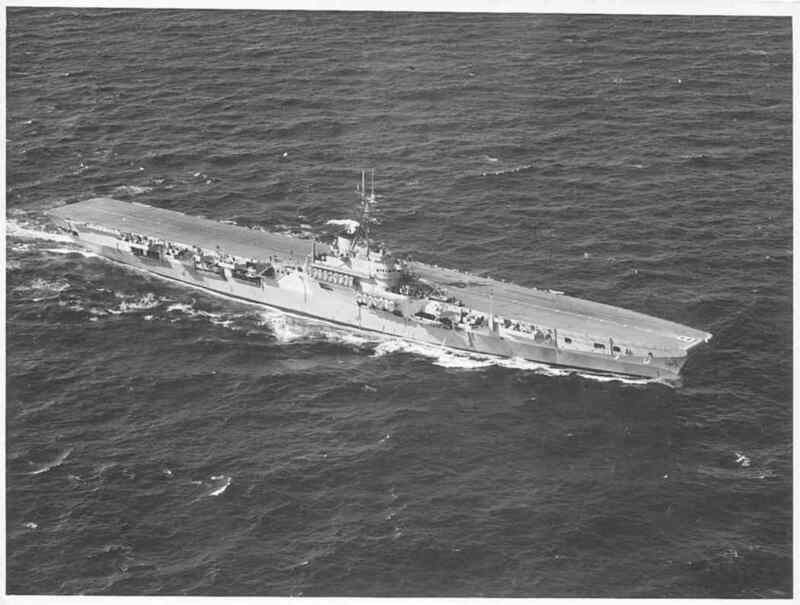 The ship was launched on 30th Dec. 1943 and was the 4th RN ship to carry the name. It had been introduced in 1784 and had previously been used in 1899 for a battleship which was sold in 1920 after service during WW1. Build was completed on 17th January 1945 and the ship was commissioned for service in the Pacific. As described below this ship served in three navies over a period of 45 years. 17th Build completion date and acceptance trials commencement. On completion took passage to Clyde for work-up. 12th Took passage to Malta. Carried out exercises with ships of Mediterranean Fleet to prepare for service in Pacific. April Deployment with Mediterranean Fleet based at Malta in continuation. prior to service in Pacific with US 3rd Fleet. July Passage to Sydney from Ceylon to join BPF in US 3rd Fleet. (See THE FORGOTTEN FLEET by J Winton and WAR WITH JAPAN (HMSO)). August Deployed at Sydney pending decision about future service in 3rd US Fleet. Oerlikon 20mm weapons replaced by 40mm design. 15th Joined Task Group 112 under RN control for operations to re-occupy Hong Kong. Refuelled at British Pacific Fleet Forward Base at Manus , Admiralty Is. 27th Took passage to Hong Kong from Subic Bay with Task Group. Entry delayed pending mine clearance operations. 30th Launched air attacks on Japanese craft in Lammas Bay. September Provided support during re-occupation of Kowloon. October Passage to Haiphong to embark passengers. 21st Sailed for Madras with Indian nationals. 27th Disembarked passengers and sailed for Trincomalee. 28th Landed aircraft and Squadron personnel. November Embarked military personnel for passage to Singapore. 16th Arrived at Singapore and troops left ship. East Indies for support of military operations against insurgents. 18th Took passage from Singapore to Bombay. December Embarked passengers and stores for passage to Tanjong Priok, Java. 4th On arrival disembarked personnel and stores. Embarked Dutch Nationals held as internees by Japanese. 12th After passengers left ship embarked aircraft. 23rd At Fremantle for Xmas. March Nominated for further trooping duties. April Deployed for transport of personnel. 3rd Disembarked 400 passengers at Singapore. June Trooping duties in continuation between Penang, Singapore, Hong Kong and Colombo. October Trooping duty in continuation. 24th Taken in hand for docking and refit at Singapore. 6th On completion of docking prepared for further service in Far East. 26th Passage to Hong Kong from Singapore. December Deployed at Hong Kong for exercises with ships of British Pacific Fleet. January Hong Kong deployment with ships of British Pacific Fleet in continuation. Nominated for return to UK to reduce to Reserve status. February Fleet exercises in continuation. 14th Sailed from Hong Kong for Plymouth with call at Singapore. March Passage to UK via Mediterranean. April Paid off and reduced to Reserve status. to Placed on Sales List. December Lay-up in continuation awaiting completion of sales negotiation. January Sale to Holland under negotiation. 1st Purchased by Dutch Government. May Prepared for service with Royal Netherlands Navy. 28th Commissioned as KAREL DOORMAN. with Royal Netherlands Navy for service in Europe and abroad. Fleet service after completion of trials in late 1958.
by a major fire on 29th April. Sold to Argentina on 15th October. Under refit at Rotterdam prior to Argentine naval service. (Note: Deployed in support of landings by Argentina in Falklands. No direct action with Royal Navy has been traced. Taken out of operational use. but this was never implemented due to lack of funding. with Brazilian Navy but her future operational use is doubtful.